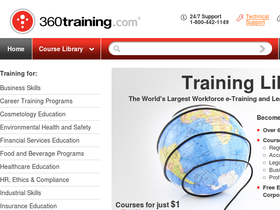 360 Training, online at 360training.com is your solution for licensing, career training, and compliance, all online. This company delivers e-learning content, technology, and services that will help you get one step further in your education plans for the future. 360 Training's most prominent products include Learning Suite 360, Learning Portal on Demand, Content Library, and Course Authoring Tool, all to lead your way to learning. RetailSteal.com is the best source for all 360 Training coupons, 360 Training promotions, and 360 Training discounts. The courses and products offered at 360 Training are all online, so there is no shipping fee required. Use this coupon code on 360 Training to save 30% on all electrical safety training. Click to save. Shop at 360 Training today and use our coupon code to save 20% on Texas Cosmetology. Use our exclusive coupon code at 360 Training and save 10% on all courses. Get 20% discount on Texas Real Estate Mandatory Continuing Education Program at 360 Training with coupon code. Use this code at 360 Training to get 5% savings. Shop at The Princeton Review and enjoy 10% savings on The Princeton Review classes and tutoring. Click here for code. Shop at The Princeton Review and enjoy $50 savings on Online and Self-Guided Courses. Click here for code. Use this coupon code on The Princeton Review to save $100 on your entire order. Click to save. Shop at The Princeton Review and enjoy $200 savings on MCAT courses. Click here for code. Visit PrincetonReview.com to get a $150 discount on a PSAT prep course. Click link to save.